Leading providers of temperature-controlled warehousing and logistical services to the Food Industry, Ardboe Coldstore located in County Tyrone, Northern Ireland, has recently expanded its fleet with the delivery of a new Volvo FH-500 tractor unit supplied by Dennison Commercials Limited. 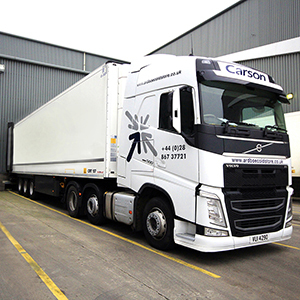 Operating at two sites in Northern Ireland at Ardboe, County Tyrone and Campsie in Derry / Londonderry, Ardboe Coldstore has the capability to store and manage in excess of 40,000 pallets of foodstuff on behalf of ‘blue chip’ food manufacturing customers throughout Ireland, the United Kingdom and mainland Europe. The truck will complement their existing fleet of mainly Volvo trucks and will be utilised on refrigerated haulage duties.